Austrian city of Linz takes double articulated trolley bus with in-motion charging in step to convert fleet to all electric operations. Bus operator LINZ AG LINIEN recently presented its first 24-meter electric bus. It is one of 20 double-articulated e-buses with In Motion Charging (IMC) technology to be supplied by Kiepe Electric. The buses are to replace the existing trolley bus fleet in Linz and bring an almost 30% increase in capacity to 180 passengers per vehicle. Replacement of the entire fleet is due to be completed by the end of 2019. For his part, Peter Pichler, Managing Director of Kiepe Electric Austria, was pleased to report that “Our excellent customer relations, close coordination with all concerned, our in-depth understanding of the aspirations and requirements of our clients and of the challenges they face, have led to shared successes here in Linz and in a recent mass transit project in Vienna.” We have also noticed a marked level of interest among our customers in all the additional options that we are now able to offer as a new member of the Knorr-Bremse Group. LINZ AG opted for a moderate battery output, implemented in conjunction with cost effective IMC. If requirements should change in the future, Kiepe’s modular battery charging system means that a high-performance battery can be retrofitted. In addition, with the newly developed Anti Icing System (AIS), a nozzle on the current collector head sprays the overhead lines with antifreeze in the evenings, reducing the formation of ice on cold winter nights. The buses, manufactured by Van Hool in Belgium, are powered by two centrally located low-maintenance asynchronous motors, developed and produced by TSA (Traktionssysteme Austria GmbH) in collaboration with Kiepe Electric in Austria. In conjunction with the maintenance agreement that has also been concluded, Kiepe’s tried and tested technology will safeguard the high availability of these vehicles. Thanks to its local presence, if the need arises Kiepe Electric in Vienna can ensure that passenger operations are virtually back to normal within 24 hours. Kiepe has been the first-choice supplier to LINZ AG LINIEN since 1983. 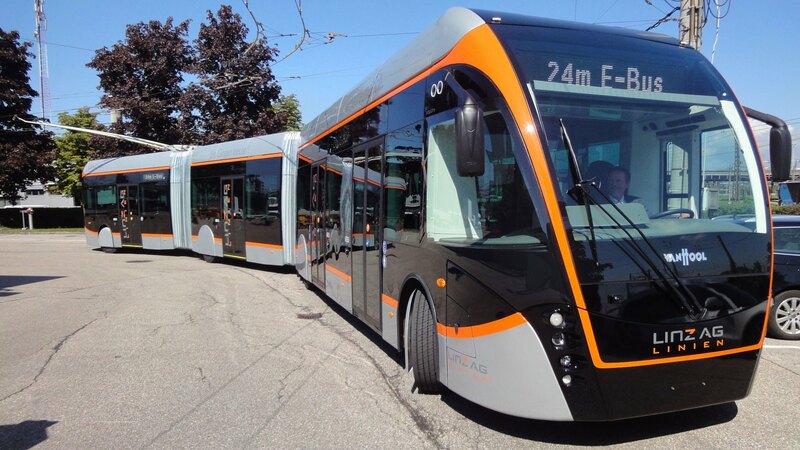 The 24-meter IMC vehicle concept signposts the way forward for many other mass transit operators around the world, above all those considering the introduction of electric bus fleets. The concept combines high passenger capacity with virtually unlimited range and permits round-the-clock operation. In October 2017, interested operators can see the Linz model for themselves on the Van Hool booth at the Busworld trade fair in Kortrijk, Belgium.